Undoubtedly, one of the most important causes for Prince Harry is Sentebale, the foundation he co-founded in Lesotho, in southern Africa. Prince Harry speaks during the Sentebale Royal Salute Polo Cup in Palm Beach at Valiente Polo Farm in Palm Beach. The event raised funds for Prince Harry’s charity Sentebale, which supports vulnerable children and young people living with HIV in Lesotho in southern Africa. At the Sentebale Royal Salute Polo Cup at Valiente Polo Farm in Palm Beach, Florida, Prince Harry spoke eloquently of the important role Sentebale serves in Lesotho by providing vital access to accommodation, care, education and critical psychosocial support for thousands of children and young people affected by HIV and AIDS. Prince Harry described the recently built Mamohato Children’s Center which is now the center of Sentebale’s operations and explained it has enabled Sentebale to increase the number of children it helps from 400 to 1,500 children each year. At the center, children and adolescents aged between 10 and 19 years old attend a monthly five-day residential camp. The belief is that if the children are educated about the virus, they not only learn about their condition but also can educate their peers about the disease, enlightening a generation and leading the way to ending the AIDS epidemic in Africa. “The Mamohato Children’s Center in Lesotho which we opened last year, would not have been built without the generosity of people like you and events like this—all seven Sentebale polo cups we have done in the past,” said Prince Harry. The prince spoke of the first visit he made to Lesotho when he was hosted by the country’s Prince Seeiso twelve years earlier. Prince Harry speaks during the Sentebale Royal Salute Polo Cup in Palm Beach at Valiente Polo Farm in Palm Beach. The event raised money for Prince Harry’s charity Sentebale, which supports vulnerable children and young people living with HIV in Lesotho in southern Africa. “In spite of the obvious differences in our lives, we shared the loss of a parent and that ever present emptiness that can never be filled,” he added. “For many of these children, their situation was compounded by the need to feed and care for brothers and sisters. As a result there was simply no time for them to be children anymore. These experiences put my own into perspective. I resolved to do whatever I could to help. I genuinely feel I need to give as much back as I can. “The result is our charity, Sentebale, meaning ‘forget-me-not’ in Sesotho, which Prince Seeiso and I founded together in memory of our mothers ten years ago,” said Prince Harry, who added that forget-me-nots were the favorite flower of his mother, Princess Diana. This year Sentebale will expand its camp program into Botswana, a country Prince Harry has been visiting regularly for almost two decades. The first goal of the Camp ‘Mamohato Network is to increase life expectancy among HIV-positive children and adolescents in Lesotho. In response to this challenge, Sentebale has developed a model of care targeted at children and adolescents which addresses this cycle. Sentebale encourages children and young people to come together through its weeklong Mamohato camps and network clubs to talk about their health issues and fears of living with HIV. “Often, for the first time, they learn to talk openly with one another about being HIV positive; learning about their medication, building friendships and a sense of normality as they realize that with the correct medication, it is possible to lead a long and healthy life,” said Prince Harry. Argentine polo player Nacho Figueras serves as the Sentebale Ambassador. He has traveled to Lesotho twice to experience first-hand the mission of Sentebale. 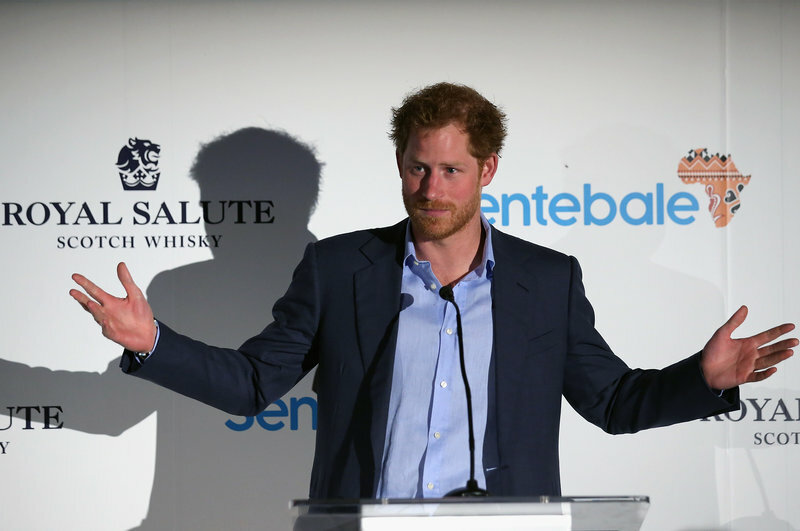 Royal Salute, the premium blend whisky produced by Chivas Brothers (a division of Pernod Ricard), has a longstanding relationship with Prince Harry and has long been a supporter of Sentebale. Global Marketing Director at Chivas Brothers Sophie Gallois speaks during the Sentebale Royal Salute Polo Cup in Palm Beach with Prince Harry at Valiente Polo Farm The event raised funds for Prince Harry’s charity Sentebale, which supports vulnerable children and young people living with HIV in Lesotho in southern Africa. The Sentebale Care Giver Initiative offers support, education and advice to grandparents or parents with children suffering from HIV, enabling them to support the youth and combat the myths and stigma associated with HIV. “This initiative provides essential life skills for carers to hopefully pass down to the next generation and to ensure the future of Lesotho for years to come,” added Gallois. (For more about Prince Harry, Nacho Figueras and the Royal Salute Polo Cup, click here). Argentine player Nacho Figueras (L) and Prince Harry pose after competing during the Sentebale Royal Salute Polo Cup in Palm Beach with Prince Harry at Valiente Polo Farm in Palm Beach. The event raised funds for Prince Harry’s charity Sentebale, which supports vulnerable children and young people living with HIV in Lesotho in southern Africa.